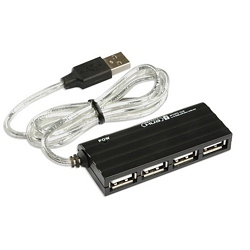 This economical 4-Port USB 2.0 hub is perfect for mobile computing. The 30-inch (76cm) cable makes it usable with desktop computers too! Requires Microsoft Windows 98SE+ or Mac OS 10.1+.